According to "CATTLE FAX" information provided by National Cattleman’s Association concerning the annual average per capita consumption of beef cuts and ground beef: The universities are telling cattle producers that they need to produce a more consistent product as well as a product with better taste and more tenderness. While the universities are recommending these things to shape the destiny of red meat, the American consumer is increasing their consumption of ground beef. In 1985, 44.7 lbs. 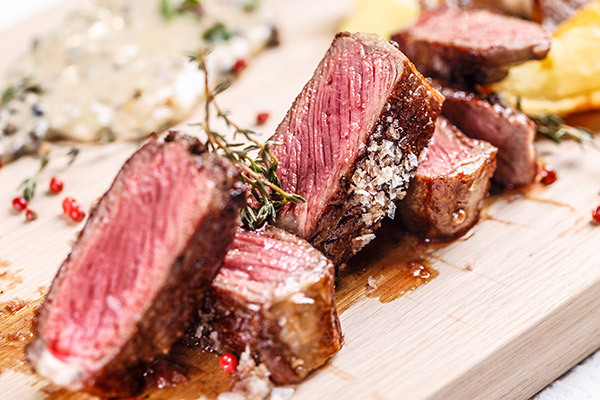 of retail beef cuts were consumed by each American. That was reduced in 1995 to 38.5 lbs. During the same period of time, the consumption of ground beef has increase to 43.7%, up from 42.5% in 1991. No matter what comes out of the colleges and universities designed to “help ranchers”, the American people have chosen a consistent product of the hamburger grinder that can be sized, cooked and seasoned to their own specific taste. Each year the percentage of lean, quality ground beef increases in consumption. It is not difficult to make future projections that non feedlot cattle will acquire a larger portion of red meat consumption in the United States. May the grinders grind on.